Refined with royal style, the Belgravia Oak Stool Grey Velvet is a wonderful upmarket design. Set at kitchen worktop height, the Belgravia is a bold backless piece that will make a grand statement at the breakfast bar, kitchen worktop, and beyond. 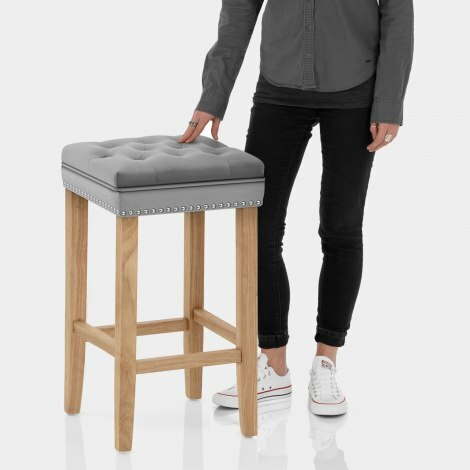 The stool radiates glamour with its grey velvet upholstery, and extra luxury is added with comfortable padding. 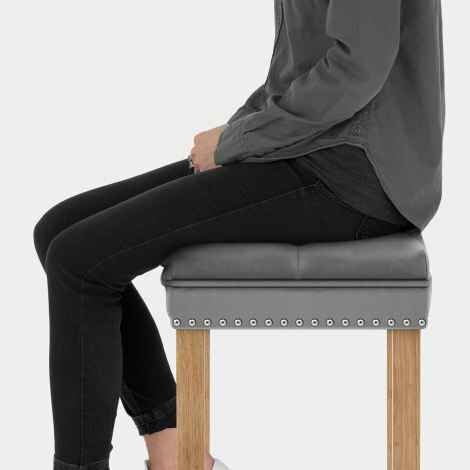 Chic piping separates the seat, with the top displaying quilted button detail and the bottom edged with shining metal studs. Finished with a natural oak sheen, the four-legged frame is crafted from strong solid wood. The legs are connected by strengthening braces, which form handy footrests, and each leg has a protective rubber guard underneath. "We are very happy with our stools"
Easy to built, stable, beautiful and comfy chair. I'm very satisfied with the purchase. Delighted with my bar stools, great value, arrived on time for a minimal delivery charge (which is great as many sites don’t deliver to Ireland) and so easy to assemble I done them myself, hubby was mighty impressed. Very pleased with the quality and style of the product. They match our new Kitchen! Arrived very quickly. Look much more expensive ! I can’t belive that these were less than £60 each, they look really expensive, made well and would be happy to pay double..... really ! I never take the time to write reviews but the service I received from this company was exceptional, if only all on line company’s were so good at customer service. Thank you.